When February and March come around in New England, winter starts to get a little old, at least for me. I’m always tempted to cash in my chips and head somewhere warm and tropical, but this year, we opted for a little getaway within driving distance of home. Portsmouth, New Hampshire has long been known as a summer destination, with its proximity to the ocean, gorgeous public parks, and bustling downtown. We were excited to find that Portsmouth’s draws don’t just disappear when the winter winds blow down Market Street. In fact, the town is as bright and bustling as ever. Sure, you have to bundle up, but there are numerous benefits to visiting this historic seaport in off season. My husband and I spent three days exploring Portsmouth and the surrounding communities in the middle of February. As is often the case, we tried our best to remain outside, first venturing around the historic town proper, and then wandering through the surrounding communities. Here’s why we loved our winter vacation in Portsmouth, NH, as well as some tips for enjoying your own winter getaway. Portsmouth is conveniently located just off of Interstate 95 near the border of New Hampshire and Maine. It is an easy drive from Boston and New York City, which makes it a lovely getaway for travelers. Tourists flock to Portsmouth in the summer, but the town is a bit more relaxed in the off season. Unlike many coastal towns that totally shut down in the winter, Portsmouth is always open for business. Visiting in the winter months will allow you to explore Portsmouth at a slower pace. You can meander along the shore of the Piscataqua River where it flows into the Atlantic Ocean, take a self-guided history tour, and pop into more than 100 local restaurants. Fair warning — you may never want to leave. Downtown Portsmouth, NH at night. 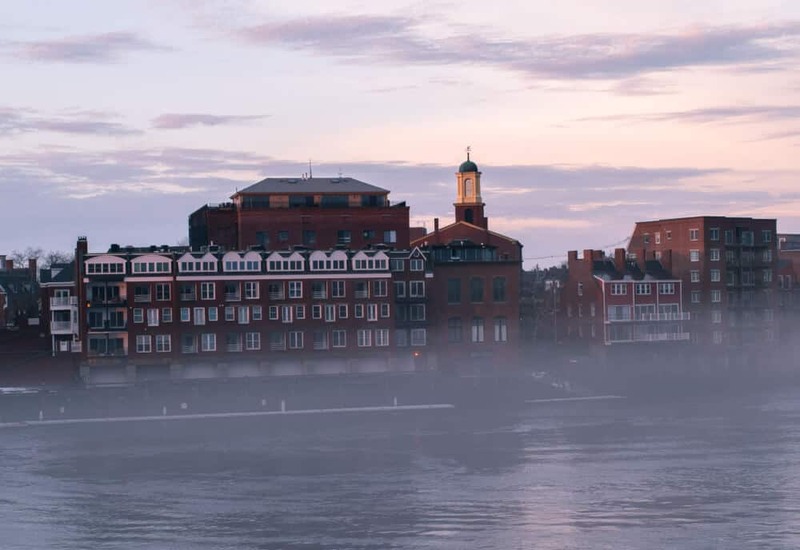 Ready to embark on an off-season getaway to one of New England’s most charming cities? Here are some of the most fun thing do in Porstmouth, NH during the winter season. Did you know that Portsmouth is one of the oldest cities in the United States? It was settled in 1623, and served as the capital of New Hampshire from 1679 until the middle of the Revolutionary War. Beautiful historic buildings, homes, and churches are scattered throughout the downtown area, and include New Hampshire’s oldest house (built in 1664), the stately North Church that towers over downtown (built in 1855), and a collection of 39 historic homes at Strawbery Banke Museum. Pick up guide and map at the Portsmouth Chamber Visitor Center, and immerse yourself in Portsmouth’s rich cultural heritage as you meander around town. You’re sure to have worked up an appetite after your tour of downtown. It’s the perfect excuse to indulge at one of the more than 100 restaurants in the downtown area alone. 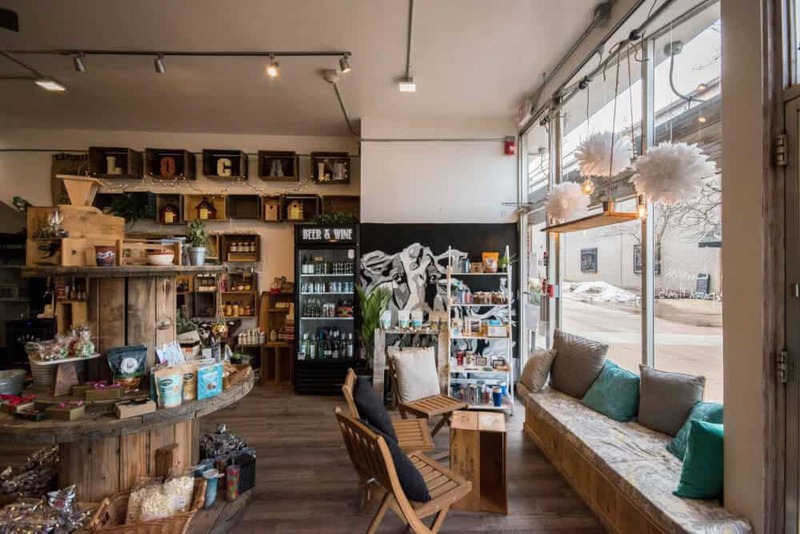 Whatever it is you’re craving, you’re sure to find it in Portsmouth, from the freshest coffee and baked goods, to right-off-the-boat seafood selections and eclectic farm-to-table meals. We had so many delightful meals in Portsmouth, so we created a separate posts about the best places to eat, sleep, and drink in the Seacoast area. Weather permitting, you can warm up any winter day with a few twirls around the ice-skating rink at Labrie Family Skate on Puddle Dock Pond, which is run in collaboration with Strawbery Banke Museum. The rink generally operates from November to March, but the exact schedule is obviously based on our crazy New England weather. Be sure to stop in for hot chocolate, soup, and baked goods at the Figtree Kitchen Cafe in the TYCO visitors center at Strawbery Banke Museum. For more on operating hours and buying tickets, check out the Strawbery Banke website. Located within the boundary of Odiorne State Park in Rye, New Hampshire, the Seacoast Science Center features interactive exhibits, touch tanks, and live ocean critters. It’s a great place to delve into ocean ecology and marine life. To make a visit even more enticing, the center sits right on the shores of the ocean, with incredible views of the crashing waves. The Seacoast Science Center is a 501(c)3 nonprofit organization, and is open Saturday through Monday in the winter, and daily in the summer. Educational programs are offered for kids and adults throughout the year, and a beautiful new exhibit space will allow for a rotating cast of cool educational displays. We loved stroking the skates in the touch tank, watching the seahorses flit around in their aquarium, and learning about Tofu, the humpback whale who was hit by a ship, and whose skeleton was donated to the center. For more about their special events and exhibits, visit the Seacoast Science Center website. You can’t visit Odiorne State Park without exploring some of the beautiful trails that crisscross the 135-acres of natural landscape. While the park is not big, it encompasses 7 distinct ecosystems, including New Hampshire’s largest stretch of undeveloped shoreline. 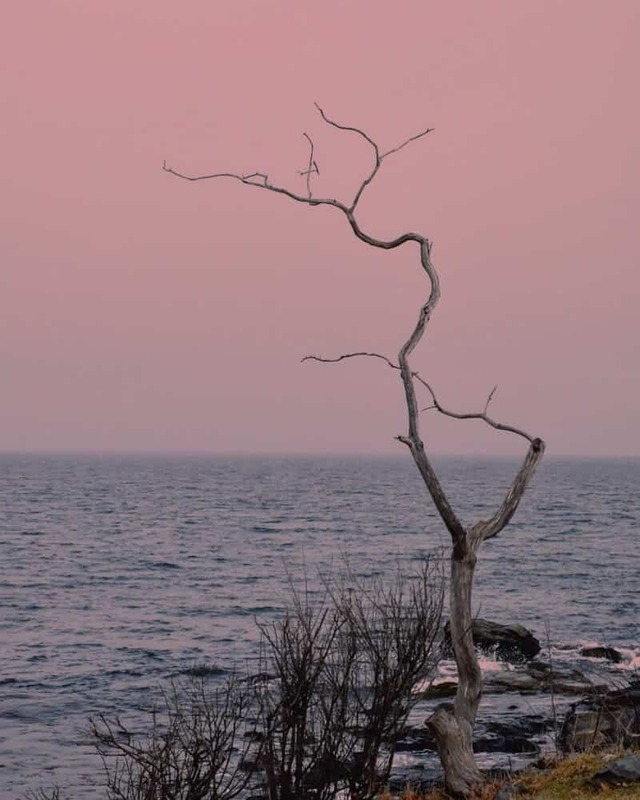 The first European settlers in New Hampshire landed at Odiorne Point, and there is a memorial dedicated to those settlers off the trail along the coast. The park is opened year-round for outdoor adventures, but pets are not permitted. For trail maps and fee information, please visit the New Hampshire State Parks website. That would be New Castle, which is also New Hampshire’s easternmost community, and the only town in the state that is located entirely on islands. Take route 1B (Wentworth Road) around the island, and take time to explore the rich history and natural landscapes along the coast. Highlights include Wentworth by the Sea, a grand historic hotel that was built in 1847, Fort Constitution and Fort Stark State Historic Sites, the Portsmouth Harbour Lighthouse, and a lovely little park called the New Castle Common. We could have spent the whole day in New Castle, there was so much to see and do. Next time! The Music Hall was originally built as a vaudeville theater in 1878. 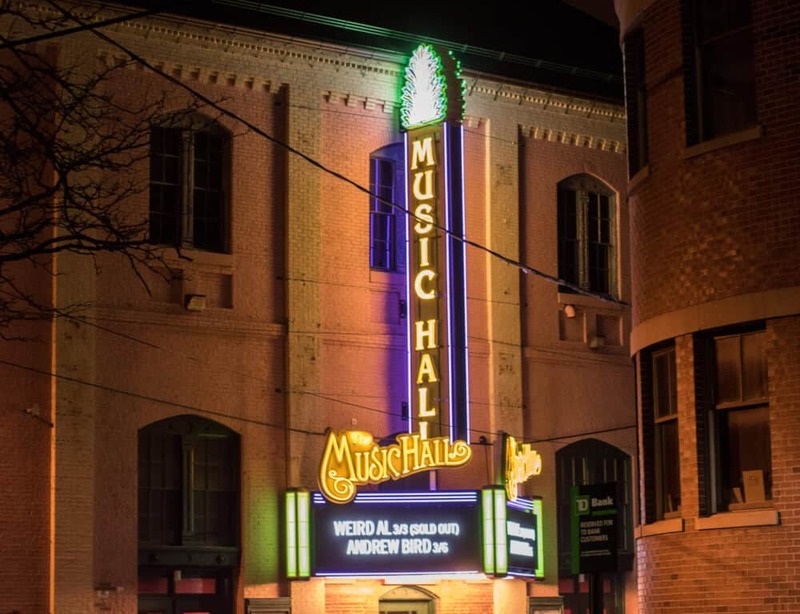 It was one of four theaters within a two-bock radius in downtown Portsmouth, and while the other theaters have either burned or been torn down, The Music Hall is thriving. Since its debut, it has been an opera house, a movie theater, and an abandoned space for roosting pigeons. A capital campaign started in the 1980s, and The Musical Hall was restored bit by bit. Today it hosts world-class musical acts, comedians, theater productions, and films. It is run as a community-supported nonprofit with a mission to promote a diverse array of performances. 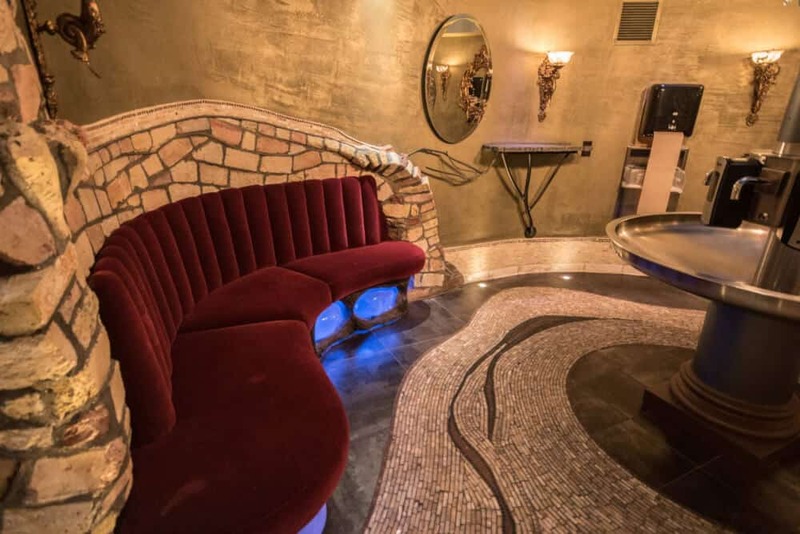 For a complete calendar, please visit The Music Hall’s website, and be sure to check out the restrooms when you go. They’re incredible. 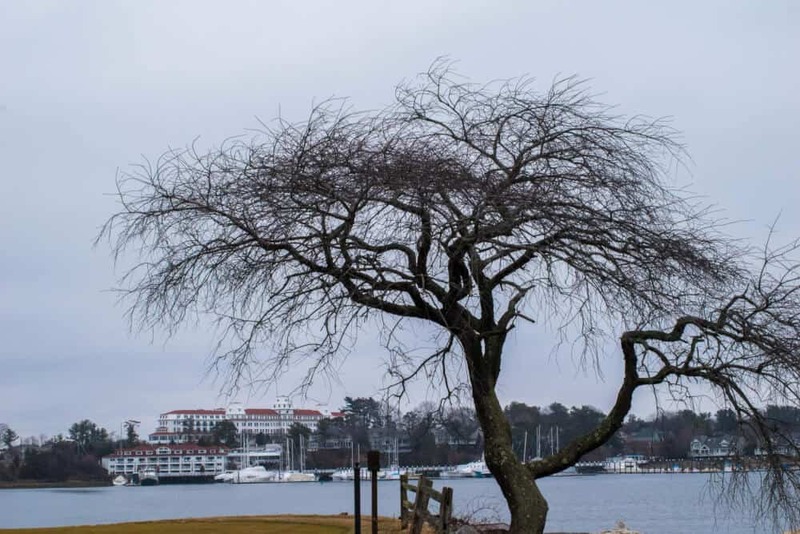 There are easily enough winter activities to keep you enjoying Portsmouth and the surrounding towns for a week or more.Be sure to pack for winter weather, and bring your appetite and sense of adventure. 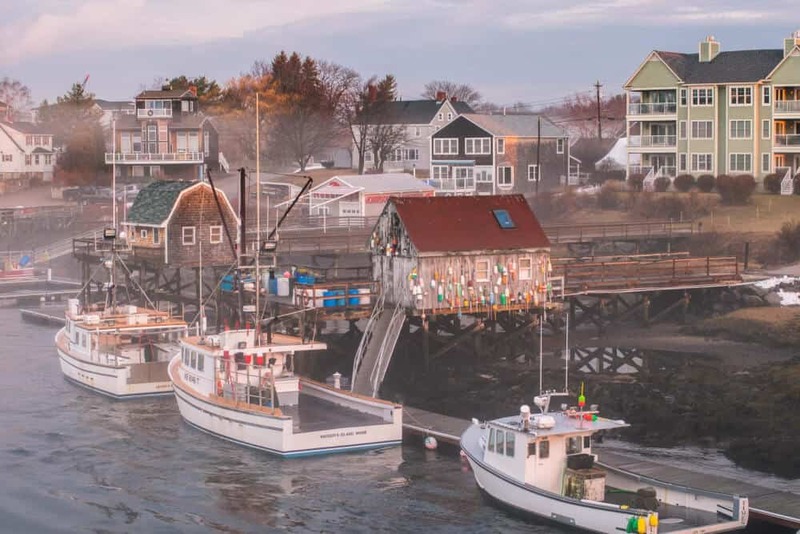 You won’t be able to resist the winter charms of New England’s most lovely coastal community. for driving to and from Portsmouth. 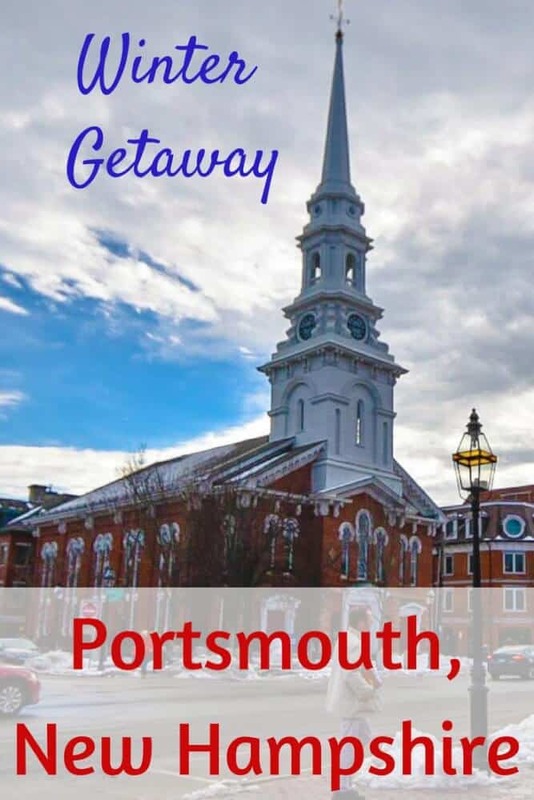 While Portsmouth is a very walkable town, having a car will give you easy access to some of the attractions outside of town. Chamber Collaborative of Greater Portsmouth – Want to know more about what to do, and where to shop, eat, and stay? The Chamber Collaborative of Greater Portsmouth has a wealth of great information on their Go Portsmouth NH website, as well as a comprehensive calendar of events. Portsmouth Historical Society – Explore the rich history of Portsmouth, and find walking tours, special events, and cool facts on the Discover Portsmouth website. 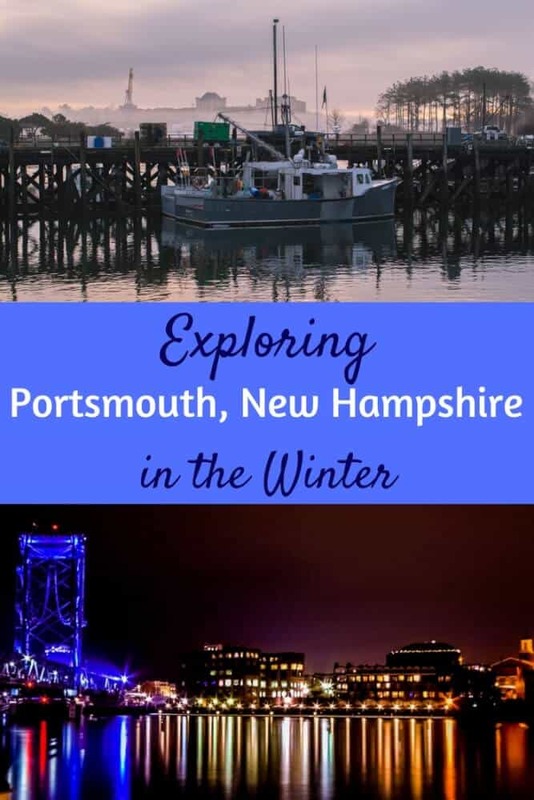 Have you ever been to Portsmouth, New Hampshire in the winter? Did I miss any of the good stuff? Disclaimer: We were generously hosted by the Chamber Collaborative of Greater Portsmouth so that we could research and write this post. As always, our opinions are entirely our own. I need to visit New England and Portsmouth looks like a great place to start for a staycation. Unique shops and of course, seafood and pastries. It’s definitely worth a visit, Tal! If you’ve never been before, I would recommend a summer visit, though. That way you can get a guided history tour and get out on the water. New England has a lot to offer in terms of food, especially the pastries and seafood! Looking forward to reading your blog post on where to eat and drink in Portsmouth. Portsmouth has some magnificent buildings! I love the North Church – such an impressive building. Would love to visit Portsmouth! New England is on my list. I have not visited enough of this part of the U.S. It can be nice to travel in the off-season. Portsmouth looks like a lovely place with lots to do. 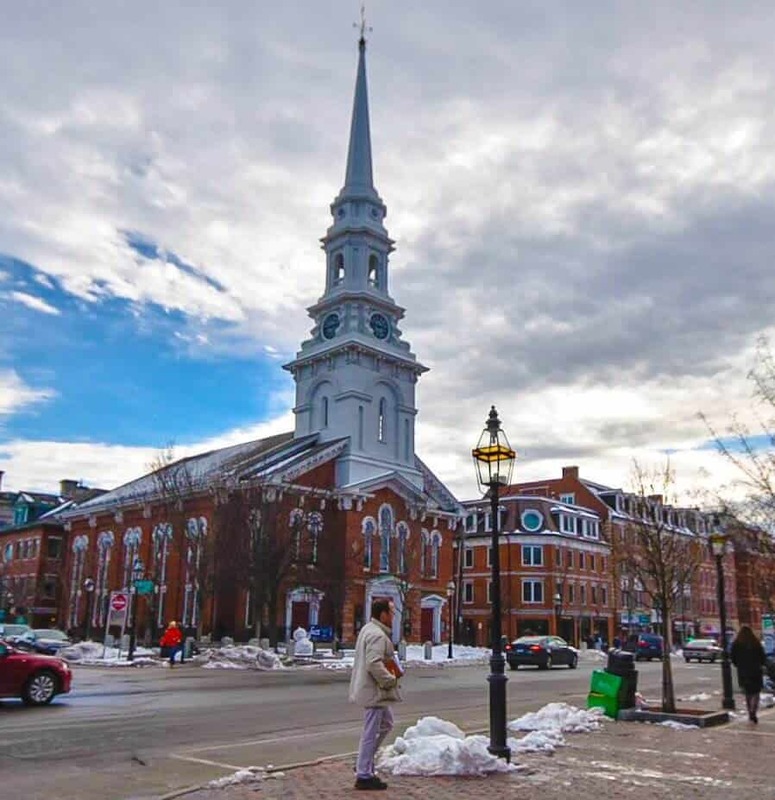 The architecture of the North Church in Market Square is exquisite ? The pictures look so dreamy! So good to hear that tourists can visit it off season too, makes it all the more easy to explore with lesser crowds! Such a historic city with vintage buildings! That walk would be quite an experience. Loved the information on the local marine life! We love visiting towns like Portsmouth in the off season. We would love to take the self guided tour through the historic district. Our kids would love the Seacoast Science Center and they would not leave us alone until we let them go ice skating. I would also love to visit the charming town of New Castle. In this era of globalization it’s very often the small towns that keep the particular, traditional charm of a region. I always wanted to go the New England for the Indian Summer, and Portsmouth seems to be a good destination. Especially the Odiorn State Park sounds spectacular. New England has so much to offer, and each town is totally unique. Portsmouth is definitely one of our favorites. It was good to learn that Portsmouth has roots in the 17th century and was capital of New Hampshire for some time. The historic buildings and historic homes at Strawbery Banke Museum would be my main point of interest if we go there. Very thankful to have read this post. 😉 I’m on a quest to finish the states I need before turning 50 and NH is one of them. While I have no desire to ever visit in winter (I’m a Florida girl) I’ve made some notes from your awesome post on things to see when I do my trip. Thanks so much! Great content. I’m sure you’ll enjoy a New England road trip, Melody. I spent my childhood in Florida, and hope to get back there soon. Please feel free to contact me if you need any suggestions for New Hampshire or Vermont. I love Portsmouth. It doesn’t take long to fall in love in New Hampshire. With its beautiful coast, New England foliage, brick buildings, it’s gorgeous. It is! Such a charming place. I havent yet been to New Hampshire but looking at that coastline in Portsmouth is exactly how I imagine it. I would love to take the walking tour of the town and to eat all of that great New England seafood sounds right up my alley. I love that church too what an amazing history to discover there. I love visiting small towns when I travel! Thanks for putting this one on my radar. The northeast corner of the US is the only part of the US I haven’t been too. Portsmouth has all the things I like to discover – history, nature, old theaters! I also love the fact that it is of the oldest cities in the US! Saving! Thanks for the awesome info! Portsmouth looks great. We are currently in Portland, Maine, and love it even though it is winter, so I’m sure Portsmouth is similar. We will have to go down and explore! Didn’t know much about it but it sure looks like a fun place to explore! Please cover the art galleries! There are three on Ceres St alone, down by the tugboats, as well as the New Hampshire Art Association and several other galleries. Most are open for Art ‘Round Town in the evening on the first Friday of the month—this is year round. Thanks, Chris. We did not have a chance to visit any of the galleries when we were in town. The First Friday events sound awesome. Can’t wait to check them out. Thank you, Tara! We enjoyed sharing our city with you and appreciate your great coverage of our winter activities. We’re looking forward to your return visit this summer when we can introduce you to the dining decks along the river! Valerie @ The Chamber Collaborative.